The Champaign County Preservation Alliance train trip on Oct. 14 is a step back in time to when the railroads were the champions of travel. ST. PARIS – All aboard for a trip through history! The Champaign County Preservation Alliance (CCPA) train trip is a step back in time to when the railroads were the champions of travel. The train leaves St. Paris on Oct. 14, traveling north on a round trip to Quincy and Maplewood, offering scenic views of the countryside and crossing one of the highest trestles in Ohio. The vintage train ride is 90-plus minutes. The railroad reserves the right to alter schedules and routes as operating conditions demand. Three trips will be offered – 10 a.m., 12:30 p.m. and 2:45 p.m. – and all tickets will be $20 per person. Children under 2 years of age may ride on an adult’s lap at no charge. Tickets are available at the Peoples Savings Bank and the Chamber of Commerce, Urbana; Security Bank, Urbana and Mechanicsburg; St. Paris Hardware and First Central Bank, St. Paris; and Peachtree Boutique in Bellefontaine. They may be ordered by mailing a self-addressed stamped envelope and payment (check, money order) to CCPA, P.O. Box 748, Urbana, Ohio 43078. Indicate the trip desired – 10 a.m., 12:30 p.m. or 2:45 p.m. – and a phone number. All efforts to accommodate requests will be made. Organizers are unable to accept credit cards. 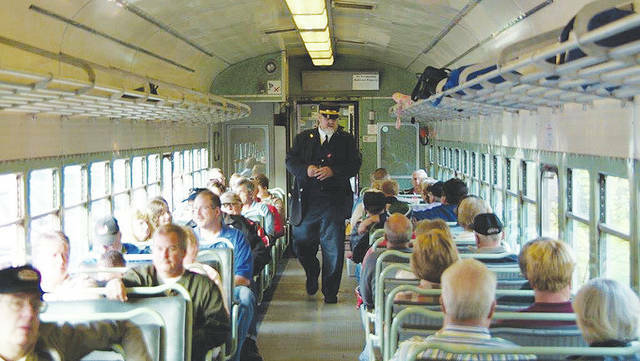 The vintage train, consisting of seven coaches and a diesel locomotive, is not air-conditioned and is not handicap-accessible due to the height of the boarding steps. It is recommended only for agile individuals. No pets are allowed and, due to safety issues, no wheelchairs are allowed. The train cars are heated, but warm clothing is recommended as waiting to board is in an open space. Boarding of the train will be along the tracks just north of U.S. Route 36 at the east edge of St. Paris off North Huffman Drive. Riders can follow the signs for easy access. Ticket holders must be in line 15 minutes prior to departure or the seats are forfeited with no refunds. Seats are not reserved or assigned and families are urged to arrive early to ensure sitting together. “As our trips are always sold out, I would suggest purchasing the tickets as soon as possible,” said Sandy Gonzalez, event co-chair. Additional information is available at the website www.ccpaurbanaohio.com or by calling 1-800-791-6010. All proceeds benefit the preservation and restoration projects of the CCPA. Information from the Champaign County Preservation Alliance.